According to the latest surveys by California-based E-Poll Market Research, these 10 sports figures rank lowest on the public’s likability scorecard. Candidacy was limited to active athletes, coaches, managers, owners, agents and broadcasters. A 10% minimum awareness level with the American public was also a prerequisite. A-Rod is down five spots from last year, when steroid talk dominated the conversation and his (championship) ring finger was still bare. Then again, Tiger and Roethlisberger did plenty to jump ahead of him since then, while McGwire only became eligible this year after taking the Cardinals’ hitting coach job. Things got better for A-Rod, a year after he admitted using steroids while he played with the Texas Rangers. While 57% of people disliked A-Rod in 2009, only 45% of people disapprove of him Wednesday. Before this marital infidelity news emerged, Tiger Woods was seen as this “perfect” sports figure, who could do know wrong. With his mystique and aura now gone, he is looking to come back from one of the most dramatic falls from grace in sports history. As of now, he has taken an ‘indefinite’ break from golf. What are people saying now? Be like Jeter. That’s the message people are sending out. The man is shining bright on the biggest stage in the world, winning the Sportsman of the Year Award and recently being crowned a World Series Champion. Not only that, but Derek is thought of as the ultimate team player, a winner, and a person that gives back to his community. Derek Jeter keeps things to himself and is a pretty private person. He doesn’t talk all that much, except when he needs to rally the troops. He doesn’t use twitter, make idiotic public statements, and declines to discuss his relationships. His performance on the field keeps all of his fans happy. Derek appeared on FOX News Channel’s “FOX and Friends” this past Wednesday. He spoke about how sometimes he doesn’t pull everything off in his life perfectly and admits that he slips up from time to time. 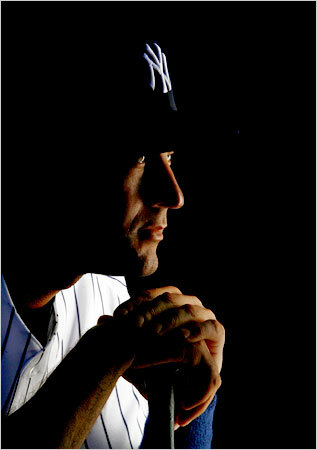 When Derek was asked whether the bright lights of the city forced him to try to live his life “perfectly,” and Jeter said that was unrealistic. The thing that we respect about Derek, is that he knows that he’s human and understands the responsibility that he carries under his belt. “Nobody’s perfect, everybody makes mistakes,” Jeter said in the interview. “I’ll be the first one to say, ‘I’ve made mistakes as well.’ I think the thing you have to realize is that everything you do, people want to know about. I don’t always think that’s fair. Derek has been linked to Mariah Carey, Jessica Alba, Jessica Biel and Minka Kelly. Isn’t it funny how nothing really negative has come out about any of his relationships? The most you hear is something like this: (On his Mariah Carey relationship) Their relationship ended in 1998, with both parties citing media interference as the main reason for the split. Nobody makes a big deal about Derek’s relationships because he’s a single man. He hasn’t rushed into marriage either like many other athletes. In December 2002, Yankees owner George Steinbrenner criticized Jeter for staying out until 3 a.m. at a birthday party during the 2002 season, saying his star shortstop “wasn’t totally focused” and that “it didn’t sit well” with him. In May 2003, the two appeared in a VISA commercial together where they went club-hopping, mocking the incident in a similar fashion that Steinbrenner and former Yankees manager Billy Martin had mocked their feud in a Miller Lite commercial during the 1970s. Derek has been in the spotlight of New York City for 15 years now, and it’s just amazing how he’s avoided all of this negative attention. He hasn’t been in situations like Alex Rodriguez, Kobe Bryant, Ben Roethlisberger, or Grady Sizemore because not only does he carry himself on the field with integrity, but off the field as well. He knows how to handle the media. The man pitches video games, Gatorade, and dates celebrities but he doesn’t focus on himself. It’s always about the team, and that’s all that matters to him. Derek doesn’t bring out team issues with the public, because he doesn’t want to make it a media thing. If asked by a reporter about something like that, he will simply ask what that has to do with baseball. He leaves things unsaid, and people respect him for it. Derek feels an obligation to represent his organization in the best possible way to the public. He has an image as a quiet leader, but that doesn’t bother him. Jeter gets it, and not many other athletes and celebrities out there do.